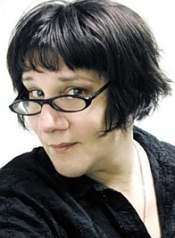 Madeleine Joan Blaustein (commonly credited as Maddie Blaustein, formerly credited as Addie Blaustein and Adam Blaustein, October 9, 1960 – December 11, 2008) was a transgender voice actor born in Long Island, New York. She died in her sleep on December 11th, 2008, after saying earlier that she wasn't feeling well. Blaustein was the voice of Sartorius in Yu-Gi-Oh! GX. She was also most known as the voices of Meowth in Pokémon (Episodes 29-Season 8) and Solomon Muto (Sugoroku Mutou) from Yu-Gi-Oh! second series anime. She was also Chef Kawasaki from Kirby: Right Back At Ya!, Dr. Kureha in One Piece and Arngrim, Lawfer and Lezard in Valkyrie Profile: Lenneth. She was also a comic book writer and artist, having worked for both Marvel Comics and Milestone Comics, and was an animation director as well. Video game localization coordinator and translator Jeremy Blaustein is her brother. Most recently, she served as Creative Director for the recently canceled Weekly World News. She is the voice of Margarete in the English language version of the PlayStation 2 game Shadow Hearts. She was most notable for her great variety of voices. In Valkyrie Profile for example, she was able to perform a very "tough", deep masculine voice (Arngrim), as well as a high-class one (Lawfer) and a suitable and somewhat androgynous voice of a mad scientist/sorcerer (Lezard Valeth). In Shadow Hearts, Margarete is voiced in a deep, feminine, and seductive style. She has also appeared as Sméagol on the Mike Malloy Show, announcing a presidential bid. Blaustein died on December 11, 2008, in her sleep from a short illness at the age of 48. This page was last edited on 24 April 2013, at 20:54.